About the size of a mosquito (just a tad bigger) this chironomid midge has amazing antennae, and a wonderful "wrap around" eye. Must say, you got a great angle on this Charlie. 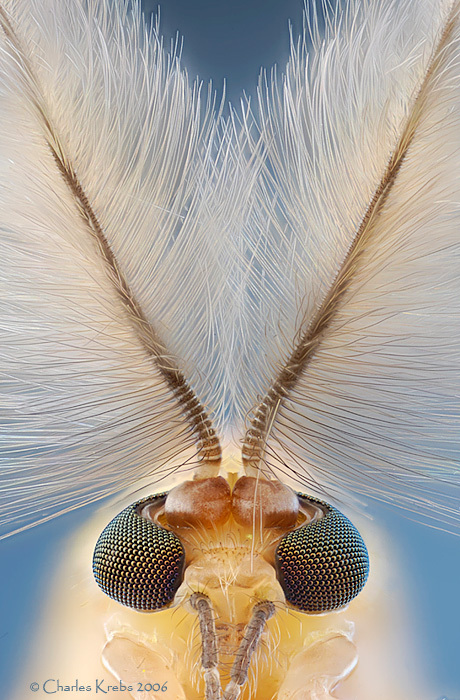 I have never seen a compound eye that wraps around the head like that. Wonderful image! Wow! Almost unreal. Incredible lighting! Now that is a plain awesome photo. These stacks are really something special. I have seen other insects, where the eyes are kind of sweeped around the base of the antennaes. The stand out great in the photo. I think this is one even the ladies will agree is very beautiful for an insect. I nearly fell of my chair when I saw this image. It's simply stunning. I only hope that I can make an image as good as this one day. How did you manage to mount the specimen without damaging the antenae They look so fragile. There is a fine line between a hobby and mental illness. I have Nikon CFI 160 10x and El-Nikkor 50 2.8 N.
Is Tominon better than these ? Better?...in a word.. no. As you can see this was done about 4 1/2 years ago and I was curious to try stacking with some of the lenses I had accumulated over the years. The Tominon 17/4 would be "competing" more with the 10X microscope objective. (The 50/2.8 El-Nikkor really serves a different magnification range). As you can see it is capable of very fine results, but its primary drawback is the f4 maximum aperture. So when it is cranked out to about 10X (for this shot it is somewhat less) the effective aperture is in the f45 range. Here you will see significantly more resolution loss due to diffraction than with a 10/0.25 objective (which is probably closer to effective f22 at 10:1). At lower magnifications it might be worth trying if you can get a really good deal on buying one. As I recall, initially it presented some really significant flare issues until I worked on the interior surfaces of the adapters I used in order to to eliminate reflective surfaces. (But that is something that should be done with any set-up... just got a bit lazy. Just seemed a bit more crucial in order to to get best results with this optic). Thank you for your extremally fast reply ! What is the best range to shoot with Tominon ? I found info - around 20x. I don't know what magnifications Polaroid suggested (10-34X based on this page: http://www.macrolenses.de/objektive.php?lang ). But you need to remember that this was used on their stands that were primarily intended for use with the 4x5" format (and naturally no image "stacking"). So the large format could stand smaller effective f-stops, and since everything was "one-shot" (no stacking for DOF purposes) there was additional room for some compromise of resolution in order to get a little more DOF. With a DSLR anything over about 7X (with a 24X36mm sensor) and about 5X with an APS-C sized sensor are probably better done with a lens that can provide good quality at an aperture larger than f4. Any ideas from your experience with this lens ? You need to really check out the inner surfaces of any tubes and adapters used. You should also avoid any strong light entering the front of the lens from outside of the subject area. I seem to remember that the rear element had a very flat and/or unusually colored coating that didn't seem to help matters in the flare department either.